MY BOOKS Shelfari: Book reviews on your book blogFind new books and literate friends with Shelfari, the online book club. and the forthcoming For the Love of Honey. But just as book three, For the Love of Honey, started approaching its publication date, I had this brilliant new idea for yet another sequel. I don’t know all the details yet, I haven’t even got the title, but I do know why it needs to be written and why everything that will be happening in the story needs to happen. These questions brought me to another question: What happens to fictional characters when they’re off page? How well do I need to know my characters to keep them going from one story to another? Rather well, seems to be the obvious answer. Well enough to make the readers care whether the Main Character lives or dies. Well enough to make the readers care for those that the MC cares about and dislike MC’s pet hates enough to immerse themselves into the next storyline. And therein hides the trap. Once the word ‘care’ comes into play, that’s it. When it happened to me, I was hooked. From that moment on my MC blossomed into Simon Grant, a person in his own right, someone I just had to know everything about if for no other reason than to keep him on side. I really can’t have my characters rebelling against me all over the page, can I? Knowing Simon rather well wasn’t good enough any longer. I had to know him intimately to move on. By now, readers know that he’s calm on the surface and passionate underneath, occasionally quick tempered, a keen observer who doesn’t get involved unless he needs to, an amateur carver of wooden miniatures, alongside many of his other poignant traits. On the other hand, I’ve stealthily learned that he doesn’t watch much TV. He enjoys riding, swimming, sailing and skiing but only when he gets a chance to do any of it himself. He’s not a good spectator. He knows that he should go to the gym more often, and he’ll get to address that in the Book 4. (Actually, I think that I’ve just found my working title for it: Book 4. As simple as that. It roils off the tongue rather well, doesn’t it?) On surface, he’s good with people, he can charm birds out of trees, but he’s got very few close personal friends, all of them carefully chosen. He likes to read but not murder mysteries or any other form of crime fiction, something that I find rather rude. Another thing that upsets me about him is that he’s not a foodie. Given chance, he’d live on sandwiches. Also, he’s quite clean, neat and tidy. I like clean. But neat and tidy?! Please?! Where has that come from? Mostly because of his parents’ high political profile, Simon is not political. He’s pragmatic, dealing with the world as it is, not as it should be. But, he’s a romantic. And how! All those qualities will continue to seep through, meld with the already known ones, and make each new book that much more personal and revealing. Anyway, why does all that matter? To me, it’s like a well stocked cupboard at my disposal, full of exquisite ingredients required for production of a sophisticated, unique and intricate product, a.k.a. a genuine human being. That’s the only way that I can think of to make sure that I won’t let him down and consequently, let myself down. Q. How long have you been writing and what life skills do you bring to your work? A. I’ve been writing and getting published since the age of five. At first it was poems, then poems and articles for children magazines, followed by my own regular slot on the radio and a youth magazine, and a regular column in a weekly paper when I was still at high school. I wrote theatre and literary reviews for the Student Magazine in my student years. I also had a drama produced by a national radio station. What skills? Well, for a start, I’m observant. I prefer watching to taking part. I don’t believe in Good and Evil as discrete entities in their own right, which makes me, in general terms, non-judgemental. I’m a great believer in Terentius’ “Homo sum humani a me nihil alienum puto”, meaning “I am a human being; nothing human is strange to me.” My life experiences are varied. I’ve travelled extensively and not just as a tourist, which means that I’ve seen first hand the slimy and often tragic underbelly of many different societies and social circles. Q. Do you research content for your work and if so where from? A. My books are set in the real world and therefore research is essential. While I was in full time work, I had the opportunity to learn a great deal about the life and struggles of the less privileged, politics, policies, market forces and human nature. After my early retirement, I’ve been working as an interpreter and translator and that keeps me informed about all sectors of society – public, voluntary and private, as well as commerce, technology and humanities. Particularly relevant is my work with the police, prisons and the courts. That’s a great source of information about systems, procedures, legislation and the way they all work in practice. That also means that if I don’t know something from my own experience, I know where to find it and who to ask. Q. Tell us about one of your previous publications. 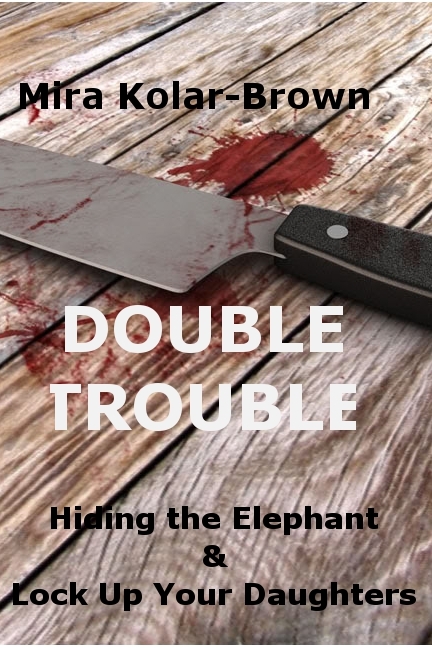 A. I’ve written and published two books in the Simon Grant Mysteries series, Hiding the Elephant and the sequel, Lock Up Your Daughters. They are both murder mysteries/police procedurals. Set in rural Northamptonshire where I used to live, they’re as much about anatomy of crime, human nature and relationships as about ‘whodunit’. I particularly like to explore the ‘why dunit’ side of the subject. Both books are written from two entirely different points of view, something I feel adds depth of perception and enriches the content. Q. What are you currently writing? A. I’m working mostly on the third book in the Simon Grant Mysteries series, For the Love of Honey. Like its two predecessors, it’s also written from two opposite points of view. Furthermore, the second POV character’s input is extended by other means. The format isn’t entirely new, Andre Guide and Aldous Huxley have used it before me, but I hope that I have found a fresh way of presenting it. I’m also working on a mainstream/historical, Klara and Her Dragons, a long term project, set in Europe between 1913 and 1975. It follows the fortunes of a woman less than favoured by either nature, birth or social background and her progress through those turbulent times. Q. What is so special to you about the ‘thriller/mystery/suspense’ genre? A. Absolutely everything! It offers the ‘grey cells’ challenge, the devil of the detail, the social and legal setup, and heaps and heaps of human nature and frailties. It’s delightful to both write and read. Q. How do you spend your leisure time? A. I love my garden, my family and friends, reading, socialising, travel (subject to health restrictions), good food, and healthy, passionate debates. Q. What is the most thrilling thing that has ever happened to you? A. OMG! So many things. Coming face to face with a wounded buffalo in the Zambian bush. Finding a way out of Angola in the middle of the night during a tense situation there. Flying through an electric storm over Java. Seeing a pride of lions in their natural habitat for the first time and watching them for an hour from just a few yards away sitting in an ordinary passenger car, or chatting to friends under a fruit tree while a fully grown, male wild elephant is feeding from it. Rearranging a date, originally planned in Rome on my way back home from Libya and his return to the UK from Egypt, with my then boyfriend, later husband, on the very night when Libya broke off all links with Egypt and having to pass the details of the new place and time plus terms of endearment via two embassies and a helpful manager of the Cirque du Soleil show. And, of course all the family births, deaths, marriages, graduations and other vagaries of that nature. Q. Can you provide links to your work? A. I’ll do my best. So, here’s the thing! I was reading an article in Writer’s Magazine about Bernard Cornwell’s day, one of my favourite authors. So, I thought if Bernard can do it, so can I. My day usually begins about 5am, but I don’t beat myself up if I have a lie in now and again. The dogs (four of them) look at me as if I’m a sandwich short of a picnic. Three of them get up, go out and then go back to bed. They’re more normal than me – ain’t that the truth?I make my coffee – always been a coffee drinker, but I don’t mind the odd cup of tea if the whim takes me – and switch my laptop on (a Dell Ultrabook XPS13). I work off a miniature 8GB Verbatim memory stick. All of my writing is on there, but I do back-ups onto another memory stick, which I keep separately. And, of course, most of my writing is in numerous places online anyway! Then I get stuck in by checking my emails, my sales, my rankings, my facebook page and I’m off. Whatever the project is I get stuck in. The whole purpose of getting up at this ridiculous hour of the day is to work in peace and quiet with an uncluttered mind. If you’re going to procrastinate (or feed the monkeys) then you may as well go back to bed. So, how did I get into writing? Well, I look back over my life and see the milestones that lead me here. As a teenager I wrote poetry, and that has continued. I was editor of a magazine called “The Gopher” in my early Army days. I used to play in the regional Scrabble championships, construct crosswords for fun, and read everything that I could lay my hands on. And then, one day about six years ago, after I’d read a book on Caesar by Conn Iggulden, I decided I could do that, so I wrote Warrior: Path of Desitiny. Since then, I’ve written twenty novels – mostly crime. I sit in the living room in my leather recliner chair. I have got a shed, but I’m not keen on spiders, and there’s no electricity in there. Now that I’m 60 years old, my wife says I can write where I want to – so I do. There’s only the two of us now – the son having finally got a life of his own – about bloody time I often say! So, life doesn’t get in the way of what I want to do much anymore. I started writing a while back when I was still teaching. The more I wrote, the less I wanted to teach. Then, four yeas ago I had a heart attack and survived. It was a good excuse to retire – so I did. I suppose I’m a writer now, and I don’t think there’s a retirement age for writers – they just get recycled through charity shops (Ha, ha! There wasn’t a joke for ‘old writers never die . . .’, so I just made that up). Maybe I should start writing humour! Hecklers can kiss my ballpoint pen! 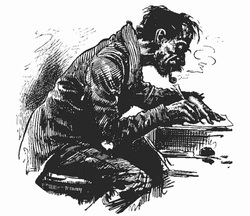 It’s just 7am, and I’ve been doing a lot of administrative tasks since 5am relating to my latest police procedural bestseller The Terror at Grisly Park (Quigg 5), which I published on Monday. Yeah, being a writer means doing loads of rubbish that isn’t actually writing, which is probably a good job because otherwise my brain would turn to mush if I tried to write all day. So, I like to intersperse my writing with frequent trips to the kitchen to make drinks/snacks/chocolate, the odd tweet/retweet, reading the news/sports on Yahoo, and so on. My days are mostly the same because I don’t want to do anything much except write. At about 8:45am I go for my shower, and then take the dogs for their first walk. Gives me a chance to think through what I’m writing and what I’m going to write next. I have a target word-count of 1,000-words a day, but again I don’t subject myself to self-flagellation if I don’t make it. Most days I achieve a lot more, but I work on a larger target of 10,000-words a week, 40,000-words a month, and a finished 80,000-word book in two months, which is what I’ve been achieving for a while now. Being old, wrinkly, crotchety and forgetful has its advantages. After I’ve walked the dog I generally get back to writing for a couple of hours. At midday I have my lunch and watch something I’ve recorded on Sky+ for an hour, and then I have a siesta for an hour or two. I get up again and start writing. At around 3pm I take the dogs for their second walk, and then write some more. At 5.15pm I put my laptop down and watch Pointless (big fan Alexander and Richard), watch the news and then do a bit more work until about 8pm and then I call it a day and watch some TV. Most of my writing gets done between 5 – 8am when there are no distractions. 2. Never use an adverb to modify the verb “said” (Elmore Leonard). I very rarely use adverbs (or “ly” words). Adverbs are telling – I prefer to show through actions and body language. 3. I don’t use “suddenly”. 4. Avoid detailed descriptions of characters (Elmore Leonard). I’m a bit in the middle with this one. I do give some description, but not too much. 5. Try to leave out the part that readers tend to skip (Elmore Leonard). Yes, I’m one of the readers that skip, and I keep this in mind while I’m writing. 6. Finish the day’s writing when you still want to continue (Helen Dunmore). Yes, I tend to do this. I go to bed, and between the light and the dark, my characters show me where they’re going and what they’re going to be doing next. 7. A problem with a piece of writing often clarifies itself if you go for a long walk Helen Dunmore). While I’m walking the dogs, problems often get solved. If your instinct is saying it doesn’t work, your instinct is probably right – change it. Don’t wait for someone else to tell you it doesn’t work. 8. Don’t wait for inspiration. Discipline is the key. I agree. Get up, get writing. Do it every day – rain or shine. No excuses – just do it. 9. Use layering. When I re-read that one time I think about: The five senses, the descriptions, the dialogue, the emotions and feelings, body language, conflict, actions, the pace, active/passive, and long/short sentences. 10. Also, I keep it simple, I make sure there’s lots of “white space” i.e. I use a lot of dialogue. I like reading dialogue. I tend to skip over chunks of description when I’m reading. 1, Keep your exclamation marks under control (Elmore Leonard). No, I tend to use a few more than 3 per 100,000-words! 2. Read it out loud. I can already hear it in my head, so I tend not to read my work out loud. Although the wife has caught me muttering to myself on occasion. 3. Cut. What I write is usually the finished product. There’s nothing to cut generally because my writing is minimilastic anyway. I re-read what I’ve written, make some minor changes, etc., send it off to the proofreader. Make some more minor changes. 4. Avoid using a thesaurus. I use the online version whenever I lose a word, or I need a definition. My memory isn’t what it was, and Statins make it worse, so I break this rule when I need to. 5. Cut out the metaphors and similes (Esther Freud). No, I break this rule regularly. Metaphors and similies are like old friends. Well, I think that’s about it. 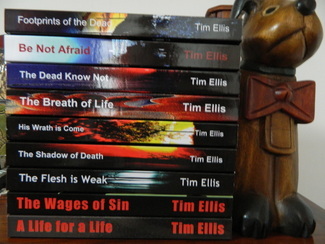 A life in the day of Tim Ellis. I’m certain that practically everyone has heard the parable of the Scorpion and the Frog so bear with me while I repeat it for the few who don’t know it. “The land is flooding and the only way out is to cross the river. A scorpion says to a frog “take me over the river on your back please” and the frog replies “I can’t. You’re a scorpion and you’ll sting me”. But the scorpion pleads his case by saying “I wouldn’t do that because then we would both drown. Trust me and take me over the river on your back.” The frog can see the logic in the scorpions argument and agrees to take the scorpion across the river on his back. It sounds silly but it really represents a very valuable, important lesson that all of us must learn at some time in our lives. The simple fact is that human beings can pretty much be divided into two groups – scorpions and frogs. Life can be very, very hard for frogs – it’s their nature to be helpful, kind and giving. This means they often get hurt and sometimes, a lot of times, they get hurt very badly simply because there are scorpions amongst us.The scorpion is a ‘what’s in it for me?’ type of person, while the frog is a ‘what can I do for you?’ type of person. Thus you can see how easily a scorpion can take advantage of a frog. They are also, by nature, very credible chameleons who do not show their true colours immediately and can easily pass for a fellow frog – to push that metaphor to the limit 🙂 – thus they can use and abuse other people until finally the real frog realises he’s been stung. And that hurts. These people will act like your best friend [or lover, room-mate, neighbour etc] and they will, initially, seem incredibly believable. Depending on how good these people are at disguising their true nature they can fool you for a very long time – slowly but surely bleeding you dry emotionally, financially or otherwise. And when you finally feel the sting and realise how you’ve been used the pain and hurt is quite devastating. We all instinctively want to believe the best in people. If we’re a frog – it’s in our nature. Unfortunately not everyone is worthy of trust or respect or love. By no means is it a bad thing to have a generous and giving nature. To want to help people, to want to have relationships – these are good, wholesome desires. What we do have to learn, eventually, though is to be a little more discerning about other people. I don’t mean we should become cynical – that only means that the scorpions amongst us have won. Instead just watch people’s behaviour and really listen to what they say. All people, no matter what our nature, ultimately give ourselves away. Our realattitudes, thoughts and desires will be shown in the things we say and the way we behave. Having a little protective shell around your heart will go a long way towards helping you to not only recognize the scorpions but to avoid being hurt by them. And always remember – you can never change another human being, you can only change yourself and the way you choose to respond.